Ace Frehley has been forced to cancel his three upcoming UK tour dates due to a fractured left wrist resulting from a fall in his home on Sunday. 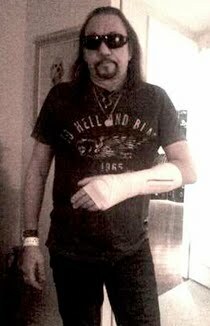 Doctors applied a fiberglass cast to Frehley’s hand and arm, and he has been instructed not to play guitar or use his wrist for a minimum of ten days. Ace would like to convey his deepest heartfelt apologies to all of his UK fans and to make it up to them, has already signed on to headline Hard Rock Hell 2012 next December. He hopes to be able to announce the additional rescheduled dates soon. The injury is unfortunate news for Frehley and his fans, as the guitarist has been on somewhat of a roll recently. Earlier this month, Ace published his new book, "No Regrets: A Rock 'N' Roll Memoir," and it debuted at #10 on the New York Times "Hardcover Nonfiction" best sellers list. Frehley had also been playing a series of dates and doing book-signing events around the country – and lots of media interviews – to help promote it, giving the guitarist his highest media profile in years.